Join us July 6th, for this SPECIAL one-day Patriotic Celebration that will feature an antique flag exhibit, live music, food trucks, craft vendors, activities, and beer/wine tent. There will be an interactive exhibit at the Row House featuring historic “Travel Trunks” and Quilts from the Allaire collection. Take time over the holiday weekend to stroll the village grounds for a festive day complete with 19th century craft demonstrations (blacksmithing, carpentry, wood carving, tinsmithing, cooking), militia training, tri-corner hat-making, red-white-blue weaving and candle-making, a reading of the Declaration of Independence, cake and toasts in front of Mr. Allaire’s Residence, and old-fashioned children’s games on the green. 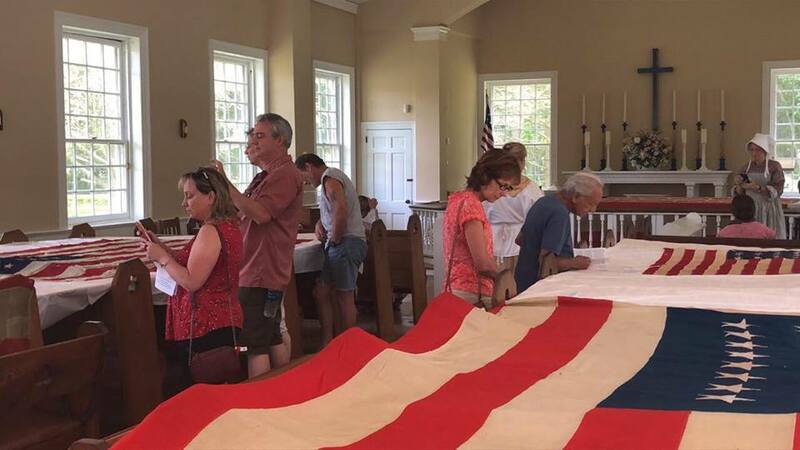 Patriotism abounds at Allaire, complete with antique American Flags in the Village Chapel. Dimensions: 10’x15’ wool bunting with cotton stars; machine stitched stripes with hand stitched stars, circa 1850 – 1880. Plus 2 more flags have been added since last year’s display. All proceeds benefit the Education Programming at The Historic Village at Allaire!